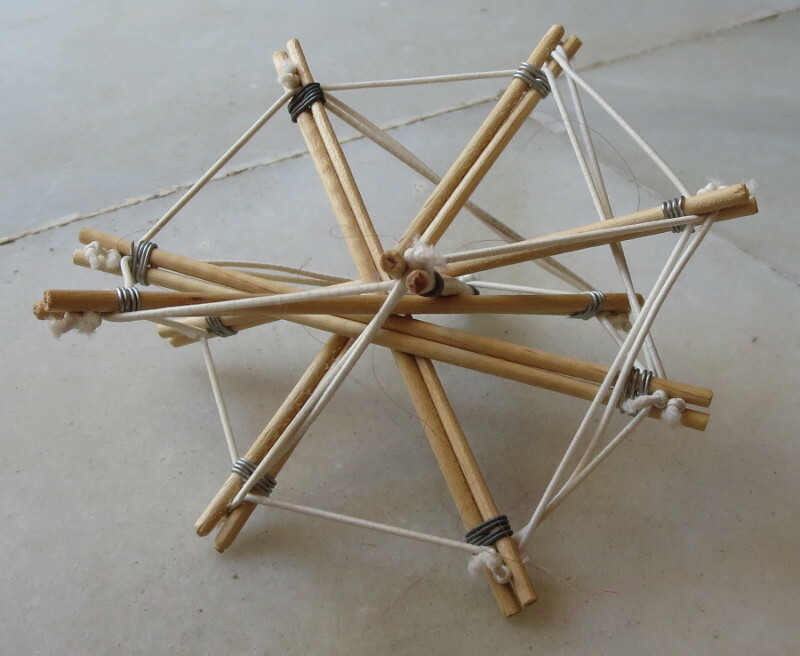 Read here about the prism, a primitive form significant to both standard polyhedral geometry and tensegrity morphology. In vernacular English, a prism refers to a transparent optical element with triangulated, flat, polished surfaces that refract light. The optical prism borrows the noun, prism, from its older geometric meaning. Euclid, applying the Late Latin term prisma, from Greek prisma literally "something sawed," labeled as a prism a volume that seems to have some of its surfaces "sawn off." The geometrical definition of 'prism' invokes concepts of polyhedra and symmetry. A prism an n-sided prism is a polyhedron made of an n-sided polygonal base, a translated copy, and n faces joining corresponding sides. Thus these joining faces are parallelograms. All cross-sections parallel to the base faces are the same. A prism is a subclass of the prismatoids. 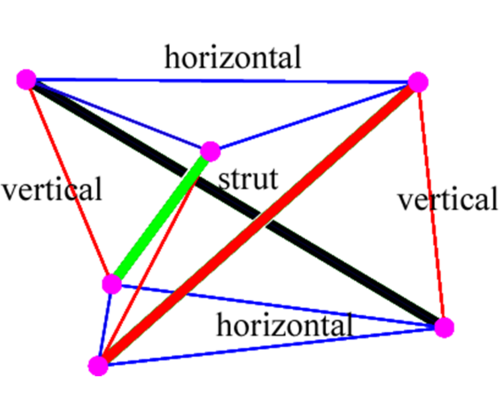 The prismatic joint is also important to research into tensegrity structures and particularly tensegrity robotics. A prismatic joint provides a linear sliding movement between two bodies, and is often called a slider, as in the slider-crank linkage. 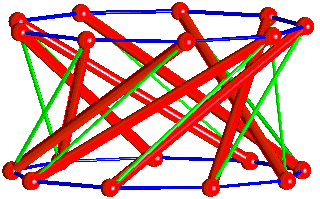 The relative position of two bodies connected by a prismatic joint is defined by the amount of linear slide of one relative to the other one. This one parameter movement identifies this joint as a one degree of freedom kinematic pair. Prismatic joints provide single-axis sliding often found in hydraulic jacks and telescopic constructions. A right prism is a prism in which the joining edges and faces are perpendicular to the base faces. This applies if the joining faces are rectangular. If the joining edges and faces are not perpendicular to the base faces, it is called an oblique prism. Some texts may apply the term rectangular prism or square prism to both a right rectangular-sided prism and a right square-sided prism. 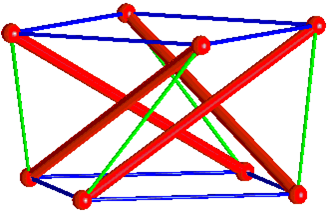 The term uniform prism can be used for a right prism with square sides, since such prisms are in the set of uniform polyhedra. 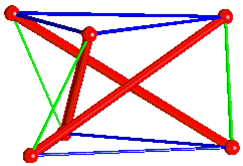 Right prisms with regular bases and equal edge lengths form one of the two infinite series of semiregular polyhedra, the other series being the antiprisms. A right rectangular prism is also called a cuboid, or informally a rectangular box. A right square prism is simply a square box, and may also be called a square cuboid. The dual of a right prism is a bipyramid. A parallelepiped is a prism of which the base is a parallelogram, or equivalently a polyhedron with 6 faces which are all parallelograms. An equilateral square prism is simply a cube. An n-prism, having regular polygon ends and rectangular sides, approaches a cylindrical solid as n approaches infinity. Below are many significant aspects of prisms in tensegrity research. They label the components and differentiate between the prism's types of stability. For more information, see Twist Angle. The direction of tendon winding is significant. 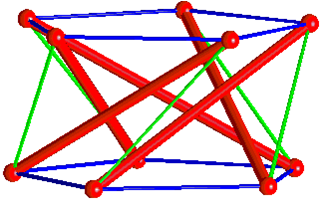 Winding in the wrong direction can cause the prism to collapse. 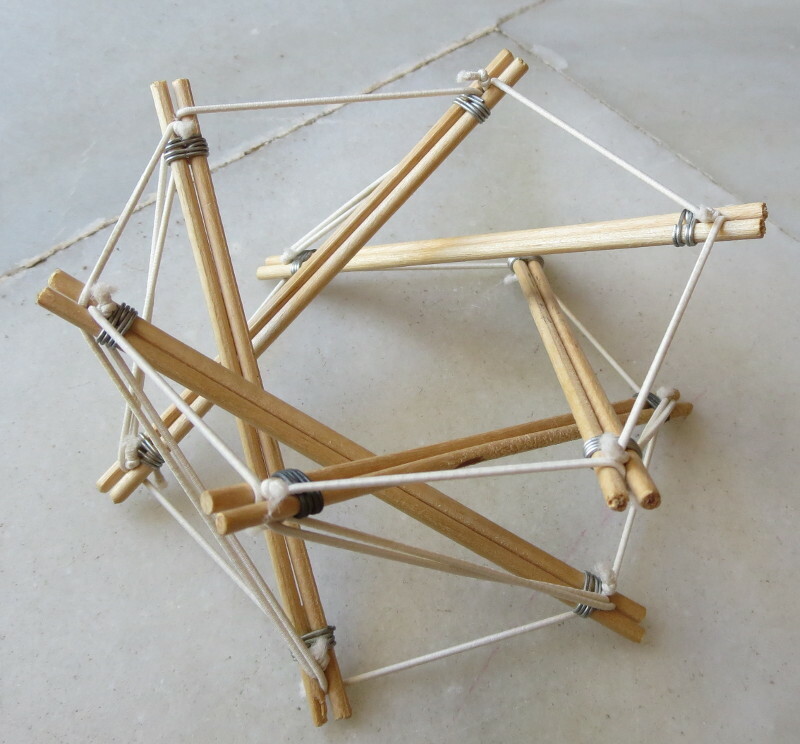 The tensegrity prism can be made deployable, if the base and cap allow the struts to fold together. [[file:8_strut_prism_self_deploying_satellite_dish.jpg|thumb|500px|none|8 strut prism forming a self-deploying satellite antenna, from a powerpoint by Carl D. Crane III"
Tensegrity prisms can be aggregated into a spherical array, resulting in a large spherical construction. 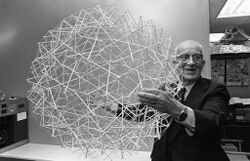 RBF with 92 prism tensegrity, April 1979. The 92 prism tensegrity is formed of 92 prisms joined in a deresonated tensegrity structure. See 92 Prism Tensegrity. This page was last edited on 3 December 2018, at 17:48.